You will see very few successful partnerships in the market but there is something unique about LG and Apple. They together have designed incredible 4K displays that are budget friendly and feature rich too. LG UltraFine 4K monitor is just a fantastic choice for beginners as well as professionals. Here are few incredible details about this UltraFine 4K monitor that will help you to make easy decision about investment. This monitor appears somewhat like UltraFine 5K but with smaller form factor. It has attractive round edges and you will not find bezels with its little face. It displays everything in non-distracting manner. The overall screen size is 21.5 inches and this monitor works like a multi-tasker unit. It is well known as professional grade video and photo editor that can be easily rotated to any possible direction as per need. UltraFine 4K has wide elevation range and its elevation mount is highly sturdy with telescopic design. You can easily handle this stand and it is possible to attach this monitor to standard VESA mount having special VESA cover. You will not find any button on its frame, not even the power button so it appears very clean. Everything can be handled with automatic tweak settings and it is also possible to manage most of the things via Mac OS also. Behind the screen, there are stereo speakers that ensure incredible performance. You must be curious to know about the connectivity options available with this fine line monitor. There are two options: Thunderbolt 3 ports and USB type port. You can access its USB-C port to manage power, audio and data transfers even with single cable. That means you can charge your MacBook directly from this monitor. Note that, the USB-C port cannot work same as ThunderBolt 3 that allows users to enjoy much higher transfer speeds but this port stays restricted to MacBook Pro. You will not be able to find DisplayPort and HDMI connection options on this monitor but it just enhances design and saves more space. Here, you will be transmitting data and videos on USB-C port instead of using ThunderBolt 3. 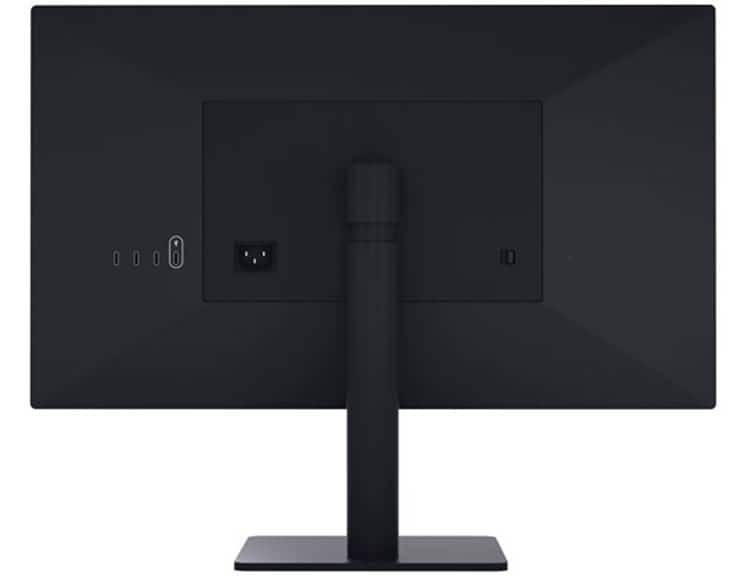 This type of connectivity limits the expected capabilities of this monitor as one can enjoy lesser bandwidth where USB-C port follows speed range of USB 2.0 port. If we call this display same as that of Apple products then the indication is directly towards its quality. Right from the moment when you turn this monitor ON for the very first time, it appears brilliant, vibrant and bright with impressively managed colours on every portion of the screen. Those who are using the retina type displays of MacBooks from several years will find this screen perfect for their needs as they need not to compromise for low resolution. This UltraFine display monitor can handle P3 color gamut that leads to incredible results for videos as well as images. It means you will find this monitor perfectly suitable to access your mobile photography with deep details. This LG monitor has matte black look on borders and that give ultimate impression. The glossy screen makes stunning color popup but this screen is not much suitable for bright locations. This 21.5” monitor can handle 4,096x2,304 resolution level with crisp details. You can access the scaling feature of MacBook to improve its text size up to readable level. Here is one important thing to note about LG UltraFine 4K monitor; manufacturers have designed it to work perfectly with MacOS with multi function screen manager option. That means, users can easily divide their monitor screen into 2 to 4 frames so that multiple things can be accessed at a time without facing any complexity in handling. All the screens get well arranged on this monitor and the displays appear perfectly fine. Now, this must be the most important question in every reader’s mind. Those who have PCs at their home must be thinking to find better connectivity options on windows. So the great news is that there is no technical issue related to such connection. But we have few reasons that limit your usage on windows. You will find several monitors that are designed with classic colour profiles. Note that, if these monitors do not find a computer that can handle extended gamut then they keep on reflecting back the details to sRGB mechanism. This is a big trouble. But when you connect such high end monitors with MacOS then you will be able to handle everything via specially designed software AppKit. It helps to make perfect negotiation with the monitor color information and everything on screen appears good. Thus, it is better to use this monitor with MacOS only. If you already own the 12” MacBook of Apple then this LG Ultrafine display unit is best choice for you. Some of you may find its 21.5” screen size little smaller but it suits perfectly to the Apple’s notebook collections. Professionals can easily handle all movements with touch bar on their device and its ability to handle multiple screens at a time makes it more suitable for high end users. The aesthetic performance of LG UltraFine 4K device is definitely awesome; you need not to make any compromise for video clarity, quality and performance on this device. The overall score as per reviewers rating is 4 out of 5 for this stunning 4K monitor. It is good to place your order fast to receive this well designed monitor soon at your door step.